What are the benefits of living in Europe? Despite the fact that Europe covers only 10,180,000 km2 (50 countries) and Europe is the second smallest continent, Europe, as a whole, currently has the largest economy in the world, which reflects well on living standards and welfare provisions. In 2009 Europe remained the world's wealthiest region. It's $37.1 trillion in assets under management representing one-third of the world's wealth. Existence of the European Union and Schengen area provides excellent opportunities for EU citizens to move and travel freely, without any physical or legal obstacles, which is an obvious advantage. Since there is a single market with unified standards in place within the European Union, the quality of products and services is also generally high. Do you want to start your own business? You can do so easily in Europe. In many European countries legal regulations allow you to register your company in as little as just 3 days - sometimes less. The single market is full of new opportunities, so that you can be free to expand your business into other European countries. Educational standards in European countries are considered relatively high. There are many universities and colleges, which offer education enabling you to compete for the best career opportunities throughout the world. The oldest university in the world – University of Bologna (est. in 1088), which still operates, is located in Europe (Italy). European higher educational facilities operate under single, unified system, which provides an opportunity for students to choose where they want to study. Also, the European Union has grants and discounts available for students who are citizens of the EU, which means that you can often get one of the best educations in the world for a good price. Work in European countries can be both interesting and well paid. The open labor market includes freedom of movement for workers, allowing you the possibility to travel to a place, where specialists in your specialty are in high demand. This allows EU member states to exchange specialists in different fields, thus making the local labour market more stable, decreasing unemployment rates and contributing to the economy and welfare of the region as a whole. Healthcare is also a very important factor, which must be taken into account. Most European countries provide very comprehensive healthcare benefits for EU residents. That is compares very favorably with many regions and provides many benefits, no doubt. European lifestyle is considered western by the majority of the world. First, there are a lot of things to see in Europe. Not only tourists from other parts of the world come to Europe sightseeing, Europeans also love travelling around the region. Europe has one of the richest cultural heritages in the world, making it a perfect object of curiosity. Open borders and small distances create an environment friendly to travellers. Each country and sometimes each city has its own traditions and language, so cultural diversity is pretty high. You can travel by car and see a lot of things, and that is what many Europeans do for vacation. Second, it is people. Most people in Europe are very friendly and open. Europeans have etiquette and respect for many things, especially traditions. Their mindset is often focussed toward living and enjoying life. Third, it is about taking it easy. People in Europe sure do know how to relax. You can find any kind of relaxation and entertainment in almost any European city: from theatres and operas to night clubs and bars. Most Europeans work hard, but they also do like to party. In case you prefer more cultural experiences, European cities have many museums, memorials, theatres etc. Fourth, it is the cuisine. European cuisine really differs, and not just from country to country, but also from city to city. Because of the high level of European integration, often you can find a wide selection of such cuisines in each city. The cuisine itself varies: from olives, kebabs and pizzas in the south to cooked fish, roasted meat and cold soups in the north. European culture has a rich historical heritage, which can be seen today in the form of museums, architecture, literature and art. Europe has a long history that dates back to Ancient Greece. Europe is considered the birthplace of a modern western civilization. Each and every of these periods had impact on modern western civilization. So if you like history and culture, Europe has a lot to offer. Of course, it is necessary to point out, that many countries in Europe have their own language. However, according to the details provided by the European Commission the three most widespread languages in Europe are Spanish, English and German. However, according to the same research, Russian and French are widespread as well. The dominant religion in Europe is Christianity, which historically has had a big impact on the formation of western civilization. However, members of the European Union respect human rights, so the freedom of thought (also freedom of religion) are well protected in law. Any kind of discrimination, not only for religious, but also racial and gender reasons, is strictly prohibited by law. 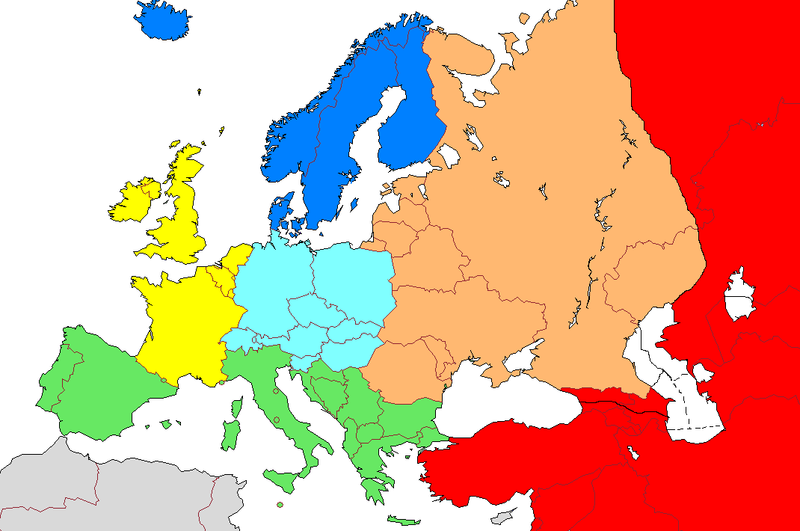 Europe is divided into 5 major regions, according to geographical factors. Each of those regions has a different culture, traditions and political background. However, the majority of these countries are members of the European Union, which means that their legislation, policy and market are controlled by the unified rules and standards of European Union. The biggest countries here are Poland and Germany. The things that stand out most about Central Europe are a strong economy, well developed infrastructure and excellent social security. However markets of these countries have a lot of competition, so starting your business here may be difficult. Smaller countries of Central Europe, such as Austria and Switzerland, are also pretty successful. World famous Swiss banks attract billions of new investments every year, contributing to the economy and prosperity of this region. People in these countries are generally intelligent and polite, which ensures a generally safe and friendly environment. The climate in the region does not generally experience severe extremes and it is possible to enjoy all four seasons. The biggest countries in this region are Russia and Ukraine, Both of which are not members of the European Union. Very often Eastern European countries are viewed as post-Soviet countries. However, several of them are now member states of the European Union and along with that have had their economy, infrastructure and welfare standards reinvigorated. The biggest discussions are caused about defining the Baltic States (Latvia, Lithuania and Estonia). The subject of the dispute is whether they belong to Northern or Eastern Europe. That is why these countries are quite often mentioned individually as the Baltic States. The fact, that the Baltic region attracts a lot of investment from Russia and Scandinavia should be mentioned. Generally, Eastern European countries are transit countries on trade routes between the EU and Russia. Starting your business here may be a good idea. The climate differs, from humid continental in the north, to Mediterranean in the south. Baltic States attract many tourists from Europe and Russia each year, which makes real estate in these countries a worthy investment. The biggest countries in this region are the United Kingdom and France. This region exports a lot of products to other parts of Europe, manufacturing is well developed. Those are the countries of the ‘Old Europe’ rich in cultural heritage. During a few last decades these countries have been overcrowded by immigrants from third countries, which forced governments to take measures and make migration policies stricter. In these countries Islam is quite popular because of the large number of immigrants over the decades. If seeking for an opportunity to preserve your national traditions and culture, these countries may be a good option. The biggest countries in this area are Italy, Spain and Greece. These countries have the warmest climate in Europe and it is a very warm place to live. During the last few years the economy of such countries as Greece, Spain and Cyprus is facing major crisis. Since the governments of these countries implement new legislation on bank services and private deposits, it may not be a good place to invest your money. Northern Europe is very often regarded as Scandinavian countries. The biggest countries in this region are Sweden, Norway and Finland. The economy of these countries is very strong. Living standards and social security have excellent quality as well. The education level is pretty high, while the unemployment rate is low. However, migration policy of these countries is quite strict, so you may have difficulties trying to acquire a residence permit here. The only minus of these countries is the climate, which is quite moist, windy and cold. This page is part of F.A.Q. section.